One of the great tragedies of being a TV tragic is the attachments we form with our favourite characters and series. Tomorrow, I (along with millions of other people) will farewell some of my all time favourite characters. I am of course talking about the conclusion of the seventh and final season of the critically acclaimed AMC drama Mad Men. I came to Mad Men a little later than some, I think season four had not long ended, and it was the middle of the infamously long stretch between that and the beginning of season five. I knew about the show of course, and it definitely seemed like something that I would enjoy. I picked up a copy of season one on DVD and then very quickly seasons 2, 3 and 4. What I discovered was one of the most brilliantly written pieces of television I’d ever seen. I was on board from the very first episode I watched. And now seven series later we’re saying goodbye to this incredible piece of work, and that is not an easy thing to do. Why is it so hard? Because stories told this well, with this much artfulness are rare. 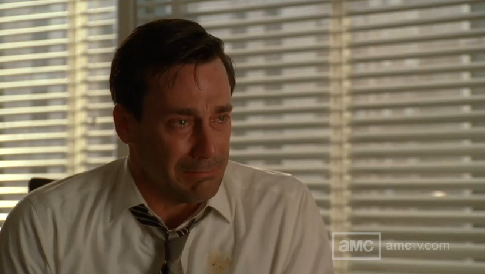 What is it that has made Mad Men just so damn good for all this time? Three things: Characters, story and the use of time. One of the greatest achievement of this series has been the creation and development of the characters, and sure, this is a hallmark of any great story, but the creation of characters is something Matthew Weiner does exceptionally well. The story has always been extremely character driven (Mad Men is like the second most famous show about nothing). Matt Weiner created Don Draper, who is in my humble opinion the best television character we’ve ever had. To me Don is a relatable every-man who appears to be an untouchable. Don Draper is the voice inside all of us that plays to our insecurities, our fears and our darkest desires. Don is self doubt and self destruction personified and I don’t know anyone who hasn’t experienced that within themselves. Of course, there’s more to Don than this, like Don’s questionable life choices designed to teach us a thing or two about morality (which by the way, according to Don is universal. Don is always consistent with his application of his morals, and sometimes lack thereof). One of my favourite things about the characters is the world they live in. Matthew Weiner created a cast of characters who exist in a world set 50+ years ago, a world that was real, and that a reasonable portion of his audience never lived in. That part of the audience relate to it only though the history books, popular culture and stories from their parents and yet it has an incredible sense of authenticity, even though we have no personal basis for comparison. I love the way that the show has marked time through its integration of real events from the decade, and what a decade it was. The 1960s were such an incredible time, particularly in American culture that it really was the perfect choice. Others have tried and failed where Mad Men struck the perfect balance. There’s a lot of speculation about how and where we’ll leave the stories of these characters, and naturally, enormous expectation. I feel for the show runners in these cases, where something is so beloved and people do feel such a deep and personal connection to the work, it is impossible to satisfy everyone, and there are always going to be fans who feel like they are owed a certain resolution. While I appreciate that nobody wants to be ‘Sopranoed’ I think it’s important to keep in mind that the ending of a show does not necessarily have to redefine your entire relationship with the full body of work. I don’t think that something as incredible as Mad Men can possibly be rendered null and void by what some people deem to be an unsatisfactory ending. It doesn’t take away the 100-and-something episodes of enjoyment that we experienced. I’m prepared to feel like I need more, but I also trust that Matthew Weiner has taken us on this journey, and that he knows how and when to end the story.